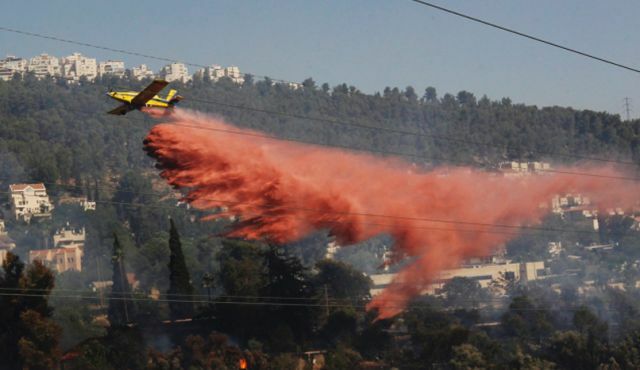 Arson is suspected in the two blazes raging near Jerusalem, which consumed 300 dunams of natural woodland and had four people treated for smoke inhalation. The fires erupted at two main entrance points to Jerusalem. The first broke out among the ruins of Lifta at the capital city’s north and spread to the Arazim Valley near the suburb of Mevasseret Zion. The second fire broke out at Kibbutz Ma’aleh Hahamisha. Jerusalem police and firefighters say they suspect arson was behind both fires. The firefighting services took no chances after the fire broke out yesterday, one week after the State Comptroller’s Office released a scathing report on the failure of authorities to properly respond to the 2010 Carmel fire, in which 44 people were killed.